Casey Carruth-Hinchey is an associate of the firm, with a practice focused on estate planning for clients with taxable and nontaxable estates and business planning for owners of closely held businesses. 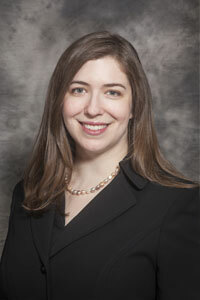 She enjoys helping clients craft thoughtful plans to provide for their families’ future. Casey guides clients in finding solutions that preserve their legacies while minimizing administrative burdens as much as possible. Her practice includes drafting wills and trusts, both revocable and irrevocable, such as Alaska community property trusts and qualified personal residence trusts (QPRTs). She has been involved in the structuring and implementation of a variety of complex gift and sale transactions. Casey also has extensive experience in preparing Form 709 gift tax returns. Casey is on the executive committee of the Estate Planning and Probate Law Section of the Alaska Bar Association, and is also a member of the Elder Law Section and Taxation Law Section. She is also a member of the Anchorage Estate Planning Council, the Anchorage Bar Association, and the Anchorage Association of Women Lawyers. She has participated in the Elizabeth Peratrovich Legal Clinic at the Alaska Federation of Natives Convention. Born and raised in Anchorage, Casey returned after graduating from the Washington University School of Law in St. Louis, Missouri. While in law school, she served as a primary editor on the editorial board of the Washington University Journal of Law and Policy. She also worked in the school’s Intellectual Property & Nonprofit Organizations Clinic. During her second semester of law school, her two-person team won the American Bar Association Client Counseling Competition. She spent her law school summers in Alaska, interning for U.S. District Court Judge John W. Sedwick, Judge Sharon Gleason (then presiding judge of the Alaska Superior Court), and the Municipality of Anchorage Legal Department. Prior to pursuing a legal career, Casey spent several years in Los Angeles, in marketing and business development for award-winning architecture firm Pugh + Scarpa (now Brooks + Scarpa). She received her bachelor’s degree in art history and a minor in classics from Pomona College in Claremont, California. Outside of work she takes advantage of Alaska’s outdoor pursuits. Casey enjoys hiking, biking, skiing, yoga, and kayaking. She especially loves flying with her dad in his 1946 J-3 Piper Cub. She also enjoys classical music and has performed in choirs in Alaska and California. While a member of the Angeles Chorale in Los Angeles, Casey had the opportunity to record music for movie trailers in classic Hollywood studios such as the Capital Records Building and Conway Recording Studios. Currently she performs with the Anchorage Concert Chorus.